Tonight, I was playing around a bit more with Firepower and I started to realize how massive the system gets after you add in vehicles and all the other optional rules. So I set up a little scenario, again based on the Sino-Soviet border clashes in 1969. This time, I took our old Soviet MRD squad from the last scenario and pitted them against an coordinated assault from a Chinese MRD team with a combat vehicle. Here's what I made for a homebrew scenario. It's nothing special but it gave me a better grasp of the rules. The Chinese are trying to spark a border incident with the nearby Soviet army on the north bank of a small river branch that divides the border between the USSR and China. This fictional scenario takes place in a village so tiny and remote that it doesn't even show up on any maps. For the past week, I've been reporting on a playthrough of "Tread Heads", a scenario from Lock 'n Load Publishing's Forgotten Heroes: Vietnam. 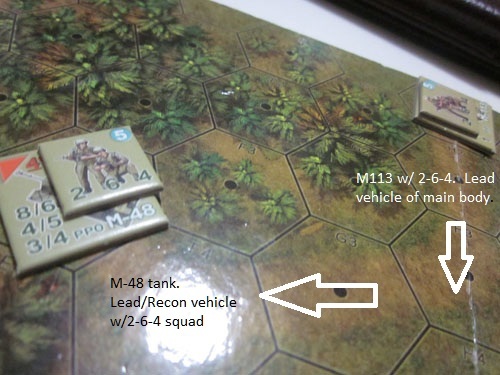 This scenario features an NVA ambush of a US armored column. In my last write-up, I detailed the many and myriad ways that the NVA thoroughly ruined the American's day in turn 5 after springing an ambush that destroyed an M-48 tank and caused the Americans to abandon an M-113. So the U.S. has taken some heavy casualties in the initial ambush. Here's what happened next. At the start of the next turn, Anders and Jensen dismount from their respective vehicles and head for the cover of the jungle to the east. 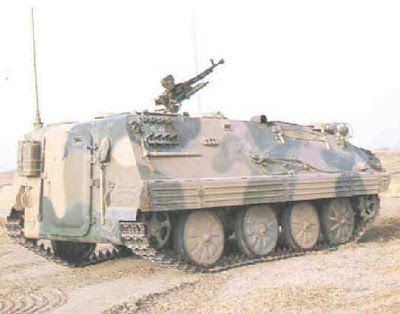 However, as the US officers and their squads start pulling back, the NVA fire on the next M-113 in the column, causing it too to become abandoned. Half of the American vehicles are now disabled, destroyed or abandoned. In LnL's Forgotten Heroes: Vietnam scenario "Tread Heads", the NVA spring an ambush on an approaching American armored column. The past couple of posts have featured a breakdown of how each side prepared for the fight. Now it's time to sit back and watch how it all panned out. In this post, I'll focus on the lead-up to the ambush as well as the ambush itself. One of the things you quickly learn in LnL games is that one placement or setup decision that is a bit off can determine the whole course of the scenario. That proved to be the case here as well, but I'll get into that a bit later. For now, we'll talk about Turns 1 through 4 in this 10 turn scenario. On Turn 1, the convoy enters with the lead tank 5 hexes in front of the main body of the column. A couple of turns later, the NVA lets the lead US tank go by without firing a shot. The main prize approaches. I've been learning the Basic and Advanced rules of Firepower lately, which is no small feat. The Basic rules are pretty straightforward but when you move into the Advanced and Optional rules, things get pretty heavy going. I made a little scenario based on the Sino-Soviet border clashes that happened during the 1960s. Since I'm playing this thing solo and just starting out trying to get a handle on the rules, I've made a couple of simple short scenarios that are admittedly one sided just to show off the craziness that can happen in this game. 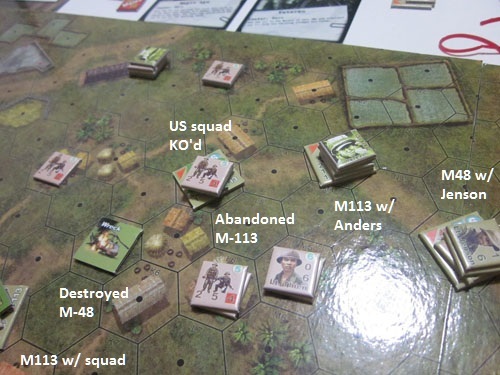 Yesterday, I talked about setup for the NVA ambush in the scenario "Tread Heads" from Forgotten Heroes: Vietnam. Basically, the US player rolls through three map boards with six vehicles (three M-113s and three M-48s) mounted with infantry. The Americans cannot spot the NVA ambush unless they move adjacent to the NVA or are fired upon (or, of course from movement). Taking this into account, the NVA set up slightly away from the road, sacrificing accuracy for surprise. Attempting to set up an effective convoy that you know is going to get ambushed is no small proposition. I tried to follow some of the basic principles from this website on convoy vulnerability. First off, heavy armor should always serve as an advance guard in the convoy to detect ambushes. Since we only have three tanks to play with here, that means that one of the M-48s will be going ahead of the convoy. "Tread Heads" is a nice scenario from LnL's "Forgotten Heroes: Vietnam" whereby a group of NVA have to nail a US convoy coming through a small village. At first, it seems a bit of a turkey shoot. The US has a group of six armored vehicles traveling in a single file convoy. The NVA can't be spotted until they open fire or a US tank is adjacent to them. I tried this scenario earlier with some disastrous results for the US when they pushed through the village with no recon vehicle in the lead. I tried it a second time with a recon vehicle, which managed to ferret out the NVA quite early as they had set up units adjacent to the road. The main body of the convoy just stopped, leisurely disembarked their men and took on the NVA with full armor support. This time, I'm trying something a little different to test out some better tactics to see if I can get a closer game out of it.